Since plantation shutters are a custom product, there are many variables in their design. The Category discusses some of the options, and what makes for a great finished product. Whether you’re considering window treatments for a new home or simply replacing outdated treatments in your existing home, knowledge of 2019’s window shutter trends could help you make your decision. This year’s trends veer towards a classic look, which means your choice could age well and stay in style for years to come. While plantation shutters have been around since the plantation mansions of the 18th century, they aren’t going anywhere any time soon. Why? Plantation shutters remain just as functional as they were then, allowing easy opening and closing of the louvres. They’re available in a range of hardwoods, and the finishes are highly customizable. For a classic, traditional look, stick with the beautiful wood grains and finish with a stain complementary to the other woodwork in your home. For a more fashion-forward look, custom shutters can be painted to match your trim work, or seize on the distressed trend with distressed or antique paint finishes. 2019 is the year many buyers are making strides towards energy efficiency, and honeycomb shades are the only window treatment on this list that qualifies for the energy tax credit. These aren’t your parents’ honeycomb shades – new in 2019, the availability of richer colors has many homeowners choosing honeycomb shades to make a color statement, especially in rooms with a great deal of windows. Honeycomb shades can fit almost any window size and are customizable to run in either direction. These shades let in a great deal of natural light, another 2019 design trend. In addition, they are often more affordable than some other window treatments. In 2019, texture is in. Woven wood shades utilize textures such as reeds, grasses, and weaving to give your window treatments that added bit of texture your room may be missing. Leave them as-is or layer with another window treatment to provide contrast. For custom shutter options, including motorized versions designed to make your life easier, contact Kirtz® Shutters for an overview. Choosing the right shutters for your home can be a challenge. You want to find shutters that are functional, aesthetically pleasing, and that match your home’s existing features. There are many options on the market with different materials, styles, and prices. Here are four shutter design tips. Do you prefer café style shutters or full shutters? Café shutters are more economical, as they only cover half of a given window. They are ideal for added privacy, but not great for blocking out light. Full shutters follow the entire pane of the window, covering or uncovering the entire window. Additionally, buyers can opt for double café shutters, meaning two smaller installations stacked on top of each other, rather than one continuous shutter. Louver sizes matter. If you have larger windows that let in nice natural light, you will likely want to opt for larger louvers. However, smaller is better for small windows in most cases, as it looks more proportional. Do you want a visible or invisible tilt? Traditional shutters have a tilt bar to grip to change the angle of the shutters. More modern designs feature invisible tilts that have no bar. They have a flatter appearance, similar to plantation blinds. Both are easy to use. Do you really want shutters all the time? 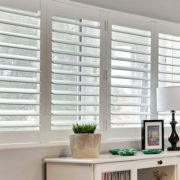 Plantation shutters are beautiful and useful, offering many benefits. Nonetheless, they are more permanent than blinds. You may opt to try shutters in one room before deciding to use them for the whole house, or a larger area. Remember that many people only want shutters in certain areas, such as the kitchen or living room. If you are interested in seeing custom shutters, plantation shutters, and all the beautiful window shutters on the market, Kirtz® Shutters is here to help! We’ve discussed this in our blog before but it has to be talked about every few years as new people come to the conversation. So what is a Plantation Shutter? In every industry you can describe something a number of different ways, and there’s rarely a standard way to do it. It may be easy for someone with a passing familiarity of shutters to mix up what we would call a Traditional Shutter and a Plantation Shutter. 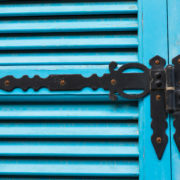 A Traditional Shutter refers to a shutter that has smaller panels and a small louver to move them, you’ll find them mostly in the North Eastern and upper Mid-Western parts of the United States. In many cases the shutters will be built in what’s called cafe style, only covering the bottom half or so of the window and are quite narrow. The shutters we’ve come to call Plantation Shutters are most common in the South and Western parts of the United States. States like California where you have amazing mountain and ocean views are excellent for Plantation Shutters as they allow you to preserve the view. Plantation Shutters will typically have larger panels than it’s traditional cousin, having a single shutter panel covering a window up to five feet tall is not uncommon. At Kirtz we sell more Plantation Shutters than any other kind and we’ve made a name for ourselves doing it. But just because Plantation Shutters are more popular doesn’t mean we exclude a style of shutter. We will sometimes make a Traditional Shutter if a customer has a need. Because of our equipment setup we do ask that if a customer would like a Traditional Shutter we ask they they have a larger project or a project that require very specific shutter dimensions. 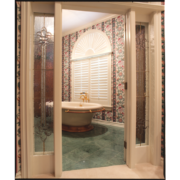 We pride ourselves on our ability to accommodate the needs of all our clients. Should you stain or paint plantation shutter? What kind of finish should your plantation shutters have? Overall look: Ultimately you want your shutters to match the look of your home. Usually this means matching the shutters to the trim of the home creating a clean, unified look. The trim to most homes is some shade of white so it’s reasonable to expect something like that. However, using a stain can add a certain, refined look to your home so it’s always worth considering both options. The Process: Depending on the wood used, it might look better to stain or to paint. In addition, if you choose to paint but decide a stain would look better it’s not as simple as just removing the paint. Often times the wood itself must be swapped out. If you’re not sure, maybe start with a stain and go from there. Options: When it comes down to it, if what you want are options, paint will give you far more options than staining. Staining has a very defined look and isn’t able to change colors very easily. Paint can come in almost every color under the sun. If you’re looking to find the perfect color match, paint is probably your best bet. 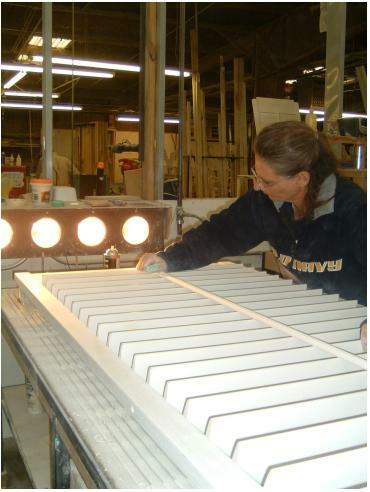 If you’re ready to start creating your very own custom plantation shutters, give Kirtz a call today at 800-416-6455! 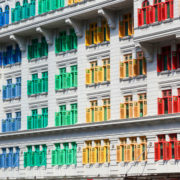 http://www.kirtz.com/wp-content/uploads/2018/02/colorful-shutter-blinds-PGN5ADZ.jpg 3744 4806 Kirtz http://kirtz.com/wp-content/uploads/2016/04/kirtz-shutters-logo.png Kirtz2018-03-21 08:00:062018-02-20 11:31:10Should you stain or paint plantation shutter? Blinds, Plantation Shutters, Or Both? Windows are critical to any home, providing natural light and making a house feel like home. So when you’re trying to decide what to cover your windows with it can be a big decision. Most homeowners want to give their windows a little extra “pop” when they pick a covering, but they aren’t sure what they want that pop to be. Plantation shutters are a durable, aesthetically pleasing, and ageless option for those dramatic windows. If you’ve got simpler windows though, you might be more cautious about plantation shutters. You may be concerned that putting up blinds might clash with the shutters. Here’s the deal when it comes to mixing faux wood blinds with real plantation shutters. According to many design experts, mixing faux wood blinds and plantation shutters is actually a popular choice for many homes. In most cases, the front of the home will have the most unique windows worth a beautiful set of plantation shutters while other windows in the home can do just fine with a set of faux wood blinds. Of course, if you live or work in a building or home and you’d like to mix things up a bit and have both blinds and shutters. Kirtz Shutters can offer what you need to get started. Yes, that’s right we do blinds in addition to shutters! Mixing these two covers works best when they’re colors and styles are as close as possible, so ordering them from the same manufacturer is a fantastic choice. With enough attention and care, you might even be able to pull off having blinds and shutters in the same room! If you’d like to consult about your custom project, or you’re simply looking for a premium quality, beautiful custom plantation shutters, call us today at 1-800-416-6455 to find out how Kirtz® can help. http://www.kirtz.com/wp-content/uploads/2018/01/window-with-shutters-P9R285N.jpg 3383 5075 Kirtz http://kirtz.com/wp-content/uploads/2016/04/kirtz-shutters-logo.png Kirtz2018-02-21 08:00:322018-01-22 11:13:00Plantation shutters AND blinds?